France Football have released an image of their top 20 highest paid managers in world football for 2018/19, and it’s fair to say there are some surprises in there. These figures, which presumably include pay-offs to managers currently without clubs, such as Jose Mourinho and Arsene Wenger, have Atletico Madrid’s Diego Simeone top by some distance. Real Madrid’s Zinedine Zidane is all the way at the other end of the list, while Guangzhou Evergrande manager Fabio Cannavaro is as high as 7th, earning double what Zidane makes. 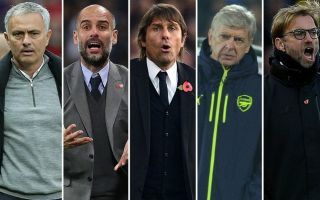 There are, unsurprisingly, a few names from the Premier League in there, with Manchester City’s Pep Guardiola the highest among current PL bosses. Also up there are Liverpool’s Jurgen Klopp, Tottenham’s Mauricio Pochettino, and Arsenal’s Unai Emery. There’s no room for Chelsea’s Maurizio Sarri, but his predecessor Antonio Conte makes it in. How much do you think these figures accurately represent the best managers in world football right now?